Have you noticed this Canadian (Montreal-based) brand when you walk into [most of] your local Shopper’s Drug Mart (SDM)? If you haven’t, then it most likely means it doesn’t sell based on the demographic since it is tailored towards women of darker (or ethnic) skin tones. 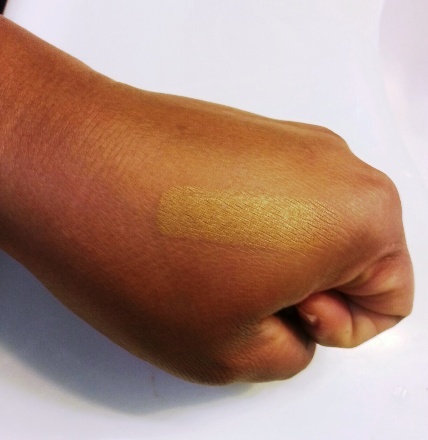 Nacara makes foundations (liquid and cream), powders (loose and pressed), corrector sticks, custom correctors, lipsticks, lip gloss, lip liners, blush and eyeshadows. I like to think of them as the drugstore version of Iman products. And Canadian! 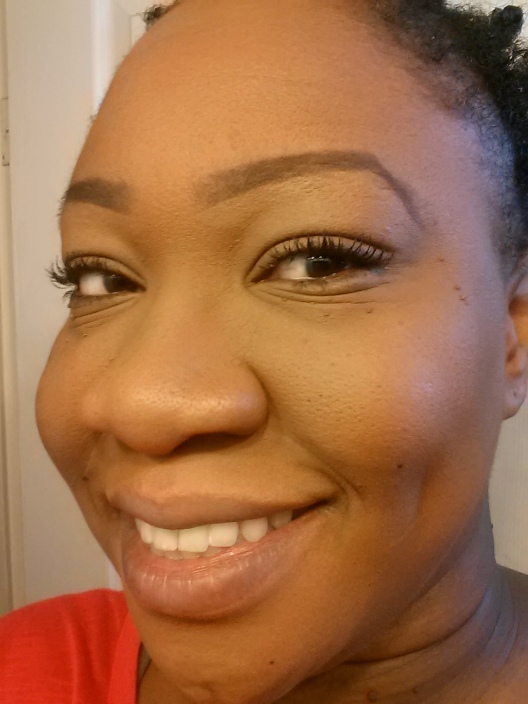 Last year I decided to try their pressed powder after my Bare Minerals (in medium tan) ran out, and was very pleased. All their products are named after exotic places which is a cute (and mildly depressing!) touch. 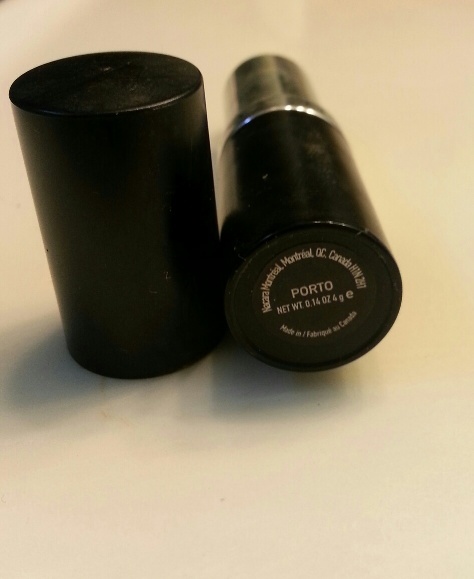 My pressed powder shade is “Cayo Largo” and the corrector stick I use is “Porto”. Since I went from being a too lazy to try foundation bb cream user to being introduced to The Perfect Match foundation from Mary Kay cosmetics, I of course got adventurous. Now I venture into the Land of Foundation to see what I discover on my trails. Now I have to wonder… Is Mary Kay really ALL THAT and a bag o’ chips? 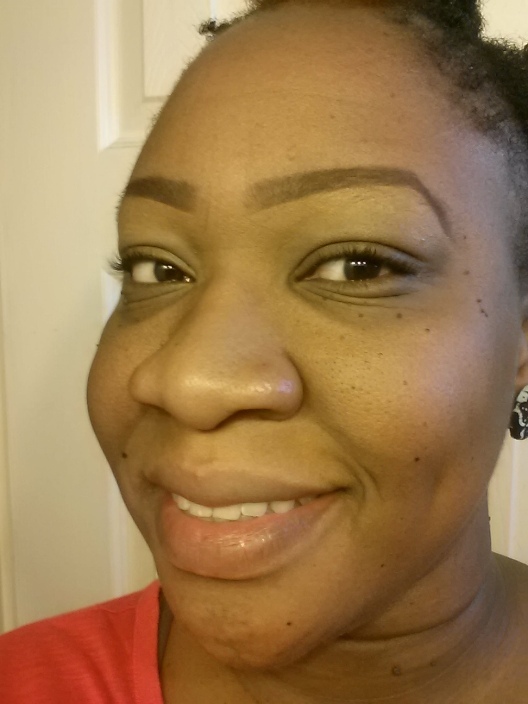 I was settled on this product and content that I no longer had to look for foundations. And then….. I had to deal with a slight meltdown when I ran out while my MK representative was away. Leme tell you it was not pretty. I decided to try one of Ash’s Top 3, CG Stay Fabulous 3-in-1 and didn’t like it because it was too light. And if it involves mixing two shades… well quite frankly I’m not about that life. That right there? Too much work. Since Canada has not hopped on the CG Queen line, MK remained in the lead. 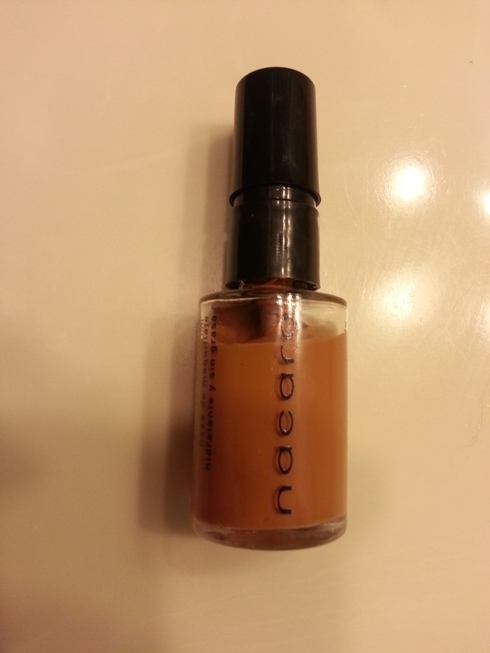 So with that, I decided to try the Nacara liquid foundation. Since this now makes three of their products that I use, isn’t that just a perfect opportunity to write a review? *Cue Psycho movie music* Aren’t those bags UH-MAZING? Don’t hate just hollaaaaaa. Okay back to Nacara. 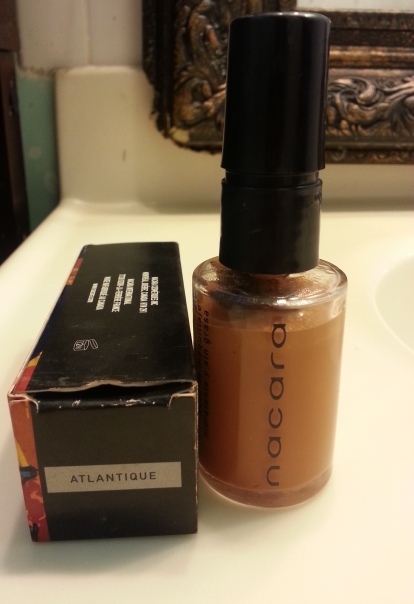 So I start with the foundation in the shade called Atlantique. I used a brush (I don’t know which one – keeping track is also too much work. Picture included below) as opposed to my Beautyblender like I did with MK. It’s double-sided and I like using the smaller side to apply foundation on my eyelids. I usually put on lipstick and blush and end here for my everyday work look, and I find I don’t even need to apply powder to set. However, if I’m going out and therefore feeling extra fancy, I will put in the extra effort and complete all the “steps” (corrector stick and pressed powder). 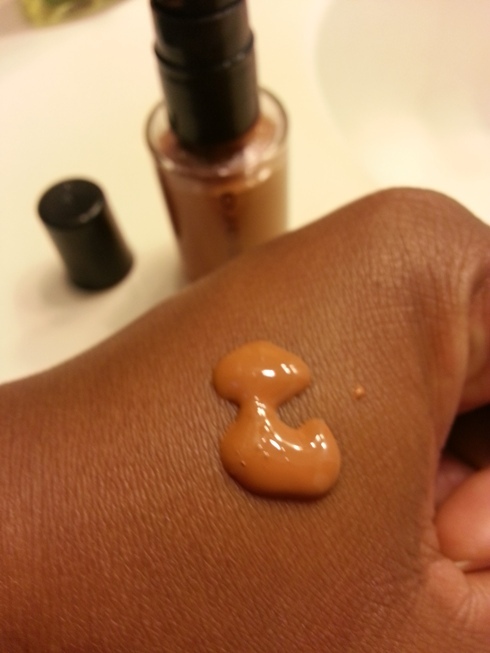 Foundation: I like how perfectly it matched my complexion and didn’t look “caked on” once I had finished. 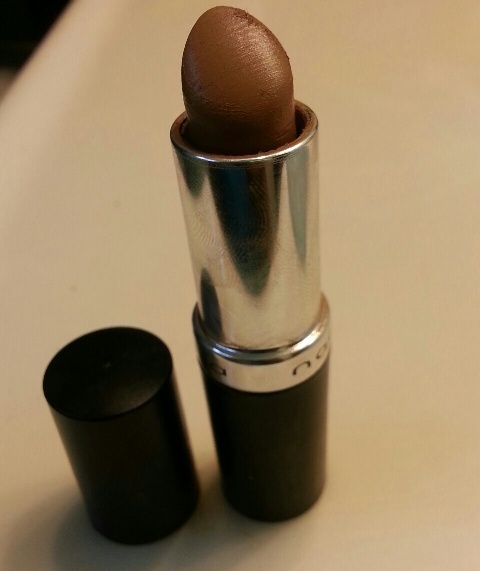 It gave a nice matte finish and I didn’t feel like I was wearing makeup. It however does not last all day and my oil shines through, but priming with Milk of Magnesia always helps that issue. So with that comparison, the Mary Kay foundation remains matte much longer. I however really do like this brand. Pressed Powder: I like how light everything feels; like my pores still get a chance to breathe. The entire process doesn’t take long and it looks natural and flawless. I’d like to share a picture of the colour, but my nearest SDM has been sold out for a bit! The foundation is $18.99 (corrector stick $9.99 and pressed powder $23 I believe). 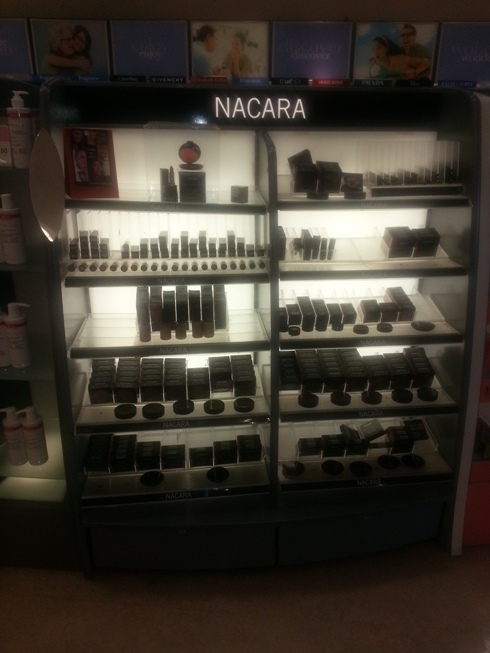 They are exclusively available at SDM, along with other beauty stores in Montreal. Have you tried this product line? If so, what were your thoughts? I like that the foundation looks matte without the need for powder to set it – less is definitely more! I’ve honestly never noticed this brand in SDM (but then again, I stick with my Annabelle and CoverGirl stuff!) but I’ll definitely check it out especially if it’s made for darker skin tones! If you do try it, let me know what you think! Wow, thank you so much for this review! I am always looking for something to match my skin tone and this sounds great. I usually use a BB cream and then bronzer to make it more warm looking, but it would be nice to have something that matches right out of the bottle for once, and something that won’t break the bank. I like that you said it doesn’t feel cakey and has a matte finish. I have never seen this line in Shopper’s, but I will make a point to look for it. I really do like it, Seph. It’s my daily go-to. You may not have noticed it because it isn’t at all the SDM’s. I’ve noticed it’s really based on the area. Please let me know if you try and like (or dislike) it! I can no longer find the brand in the Toronto area. What has happened? Hi Red – that’s too bad. I can still find it at the shoppers close to where I live, but lately I have noticed that the shelves aren’t being restocked. That’s never a good sign. I would miss it for sure! Hi AngelGlow – I’ve noticed that there is barely anything left and I’ve even asked the cosmetologist at my neighbourhood SDM but they had no information. It’s really unfortunate because I really, really enjoyed the line as well. I live in the Halifax area and I can no longer find Nacara products. Do you know if they are still in business? And, if so, do you have contact information for them? I love their lipstick. Hi Christine – I don’t think they’re around anymore, and that makes me really sad. I loved their products. Here’s to hoping they come back.